The Smith & Wesson M&P 15-22 is one of the most affordable AR-15-style rifles on the market. Its introduction in 2009 gave us a low-cost option for an AR-15-style rifle, with far cheaper ammunition and parts than most AR-15s out there. This lightweight .22 caliber semi-automatic rifle has had its praises sung by many in the enthusiast crowd. If you’re a proud owner of an M&P 15-22, it’s likely you’ve already found out why. From its low recoil and newbie-friendly handling to its surprisingly quiet demeanor and affordable aftermarket attachments, this rifle is an ideal first gun for aspiring hunters and plinkers. However, in almost all other regards, the M&P 15-22 is a standard .22 caliber AR-15, with a similar disassembly process and safety lock mechanism. Let’s see how well it performs out on the field. Afterward, we’ll go and look for the best scope for M&P 15-22. Like most rimfire rifles, the Smith & Wesson M&P 15-22 excels at close-and mid-range, while falling behind a bit at long-range. Out of the box, the M&P 15-22 performs at its best in the 50 to 100 yards range. However, you can easily hit a target up to 200 or even as far as 300 yards away, if you know what you’re doing. Close-range is usually defined as under 50 yards. While the M&P 15-22 can perform decently at long-range, it’s not really meant for that. M&P 15-22s use what’s called rimfire cartridges, which have a low-pressure firing mechanism. That’s ideal for plinking, target shooting (Olympic rapid fire target shooters use .22 “short” caliber rimfire ammo) and hunting varmints. That’s not as good for long-range sharpshooting, but rimfire ammo is also a lot cheaper. It’s a give-and-take. With that in mind, let’s take a look at what kind of scope you will need. The rule of thumb here is that the further away your target is, the higher the magnification you will need. For close-range targets (up to 50 yards away), 1x to 4x will do the trick. At medium range (50 to 100 yards), you can get by with a scope in the 4x to 6x range. 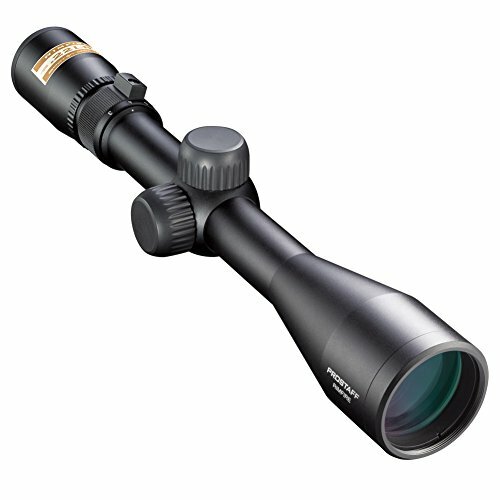 Lastly, at longer ranges (100 yards and over), you will need more than 6x magnification, up to 9x. Remember that the M&P 15-22 and other rifles of its ilk aren’t really made for long-range shooting, so you likely won’t need very high magnification. Remember, practice is No. 1 in this field, but good gear is a close runner-up. Finding the right scope for your rifle is the difference between having a frustrating, boring time at the range and having fun. It’s also the difference between hitting the turkey you’ve had your sights on for the past few minutes or letting it escape. If you’re a beginner, it can be tough to tell apart a good scope from a bad one. But if that’s the case, don’t worry, we have you covered. After a little digging around, we’ve found our four favorite scopes for the M&P 15-22. Let’s dive in and take a closer look at each of them, to see which is the best scope for M&P 15-22. What the Nikon ProStaff Rimfire lacks in power, it makes up for in just about every other category: accuracy, lens clarity, build quality, price and looks. At an incredibly generous price point, the ProStaff Rimfire brings the high-grade lens properties one can expect from a master of optics like Nikon. The crosshair is crisp and clearly visible. The lens is so clear, it only takes a few minutes to zero in at 100 yards. Despite the low recoil of the M&P 15-22, the ProStaff Rimfire’s 3.5’’ of eye relief is still a welcome feature. Its quick-zero reset turrets take away the hassle of fumbling with knobs while you’re out in the field. The adjustment mechanisms on this scope feel very smooth and responsive. This scope also boasts a bullet drop compensation (BDC) feature, a nifty extra I didn’t expect to find on a budget scope. Lastly, the ProStaff Rimfire is surprisingly sturdy for the price. It doesn’t feel flimsy in the slightest. It’s waterproof, of course, but it can take a fair bit of wear too. I have a clumsy friend who dropped his from about 3 feet, and the scope survived completely intact. However, I don’t recommend trying that with yours! Where the ProStaff Rimfire really excels is in the clarity and sharpness of the lens image. Most rifle scopes have light transmission somewhere in the 80 to 90% range. However, as a world-renowned camera maker, Nikon is able to flex their muscles here. The ProStaff Rimfire boasts as high as 98% light transmission, which is truly exceptional for what this scope costs. There are very few cons if any, I can think of with the Nikon ProStaff Rimfire. The only slight drawback is that, at closer ranges, you won’t be able to adjust the parallax compensation on this scope. That can lead to a bit of blurriness. Other than that, what we have here is a precise, sturdy and feature-rich scope for a bargain price. Another budget rifle scope, the Bushnell Optics Drop Zone-22 is a great choice for close-to mid-range action, whether it be out hunting or on a practice range. Its feature set is surprisingly robust; this rifle scope has bullet drop compensation, target turrets, and parallax compensation, among other useful features. That’s quite a lot for this price point. Made of an anodized-finish aluminum alloy, the Drop Zone-22 is very sturdy, and its lenses are Q-ring sealed to protect the scope’s insides from dust and water. It’s also fully fogproof and rustproof, adding to its ruggedness. The Drop Zone-22 will fit and work on just about any .22 caliber rifle, as long as the rings for mounting it are the right ones. What sets the Drop Zone-22 apart is its precision and clarity. It easily holds a zero at 50 yards and can be aimed with up to 125 yards. That isn’t very far, but this scope wasn’t designed for long-range, after all. With 3.7’’ of eye relief, every shot you take will be painless. For M&P 15-22 owners, the Bushnell Optics Drop Zone-22 is just about the ideal budget rifle scope to go along with your budget AR-15. In this case, don’t let the “budget” label fool you. It’s a featureful, rugged and, most importantly of all, effective scope. The only drawback with the Drop Zone-22 is that the turrets and knobs are a little stiffer than I’d like. But, that’s nitpicking when we get down to it. The Nikon P-RIMFIRE is a slightly costlier version of its cousin, the ProStaff RimFire, but is it worth the higher price? As with most Nikon scopes, you can expect robust lens properties from the P-RIMFIRE. Crisp optics, with a clearly visible crosshair and unmatched clarity up to a distance of 100 yards. The P-RIMFIRE is made of polymer, and anodized-finish aluminum, a sturdy mix that’s tough enough to withstand the usual wear and tear a rifle scope is put through. None of its pieces or parts feel flimsy in the slightest. Of course, it’s Q-ring sealed and nitrogen-filled, so you can rest assured the P-RIMFIRE is fully waterproof and fog proof. Its adjustable zero-reset turrets make it quicker and easier than ever to sight and zero in, ensuring you don’t waste time engaging your next target. I mentioned earlier that the P-RIMFIRE offers “unmatched clarity up to a distance of 100 yards”. Sadly, that’s one of the cons of the P-RIMFIRE. Past 100 yards, this scope’s parallax compensation (which is set to 50 yards), creates a slight blur. That’s not awful, given that this scope is made, after all, for rimfires. But, it’s a trade-off and it’s worth mentioning here. The P-RIMFIRE starts to get fancy once you fire up the Nikon Spot On app. While it can come off as a gimmick at first, the Spot On app is actually a nifty feature. It’s certainly useful for beginners who’re having trouble finding the right adjustments. I’ll admit, I get lazy from time to time and use it myself. It’s a welcome, but totally optional, extra from Nikon. Aside from the fuzzy optics you sometimes get at long ranges, the Nikon P-RIMFIRE is a superbly effective rifle scope. It has just about everything you can ask for. Whether or not it’s worth buying over a Nikon ProStaff-Rimfire is up to you, but you can likely find it on sale (which I usually recommend). In conclusion, Nikon has done it again with the P-RIMFIRE. Would also be excellent for Ruger 10/22 and Marlin 60. Leupold has always been a premium brand, but will the 113872 VX-1 continue the trend of unmatched quality? The priciest by far, the 113872 VX-1 sets out to be a “Jack of all trades”, offering optics with amazing clarity, just the right degree of magnification (to perform well at close-, mid- and long-range) and, of course, unparalleled build quality. 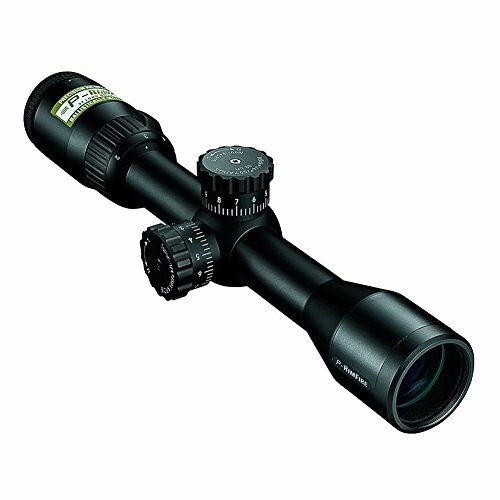 Unlike most other variable power rifle scopes, which have a 3x to 9x range of magnification, the 113872 VX-1 has a 2x to 7x range. In other words, it performs excellently at close- to mid-range, but not as well at long-range. However, let’s face it, rimfire rifles aren’t intended for very long ranges, so this is actually a very wise compromise on Leupold’s part. The 113872 VX-1 is very light, which of course helps with the balance of the rifle. Its parallax compensation is adjusted for 60 yards, but it should work without a hitch for up to 100 yards. Its so-called “Multi-coat 4” lenses offer amazing clarity and contrast, even in low light. 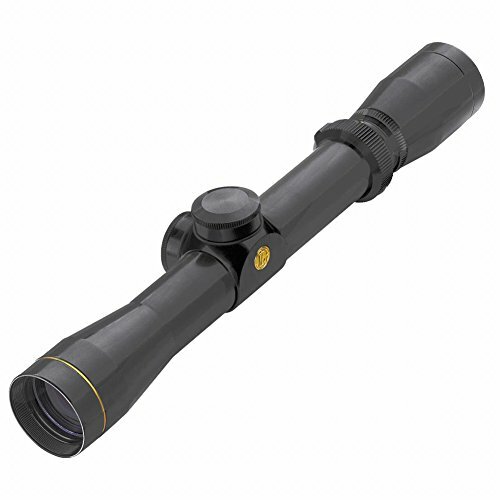 As with most Leupold scopes, the 113872 VX-1 is fully water- and fog proof. Where the 113872 VX-1 truly excels is in its precision design, a trademark of Leupold rifle scopes. The adjuster knobs for windage and elevation are, as always, buttery-smooth and supremely responsive. You never feel like you’re not in control of the scope. 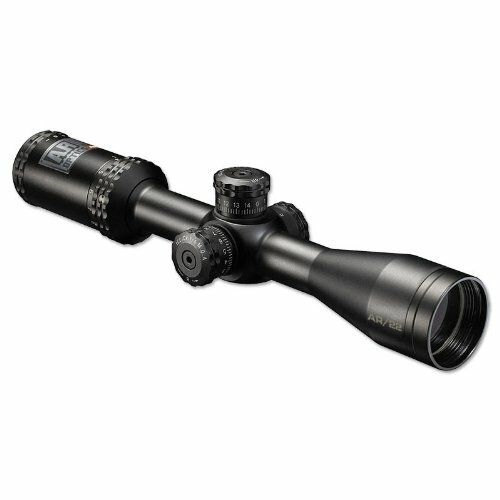 Like most Leupold rifle scopes, the 113872 VX-1 scores high marks in every category. Its only notable flaw is its somewhat basic crosshair, but that’s a very minor con, one that a lot of people can excuse. Is it worth the steeper price? If precision design, a robust and sturdy construction, and performance at close- to mid-range matter to you above all else, then the Leupold 113872 VX-1 is a great choice for an M&P 15-22 scope. All in all, if you’re looking for the best bang for your buck, the Nikon ProStaff Rimfire is miles ahead of its competitors in that price tier. However, if you’re looking for the most refined scope design-wise and aren’t afraid to pay a premium for it, the Leupold 113872 VX-1 can’t be beaten. In the end, we hope this article has helped you out in your quest to find the perfect rifle.